Cockies Tongue ( Templetonia retusa, FABACEAE ). The caterpillars pupate in their twig, anchoring it to a branch or convenient object. 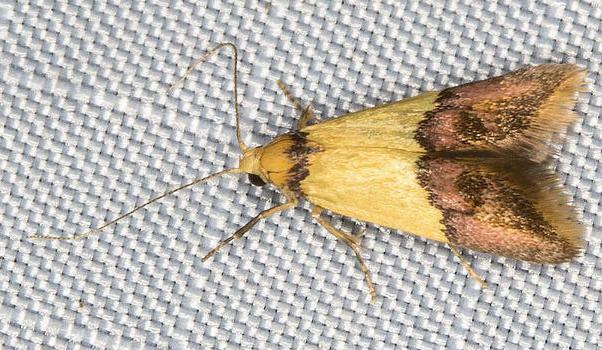 These adult moths have brown forewings each with an orange fringe of hairs along the margin. The wingspan is about 2 cms. Melbourne University Press, 1990, fig. 79. CSIRO Publishing, Melbourne 1994, pp. 6, 8, 625, 618. Volume 18 (1894), p. 101.